Rebecka Walters lost 20 lbs. in 10 weeks with FOCUS T25, Shakeology, and the Beachbody Performance supplements. She entered her results into the Beachbody Challenge, and won the $500 Daily Prize for November 13th! Before I started FOCUS T25, I would feel unmotivated to work out. I would also struggle to find the time! I hated the way I felt and hated what I saw in the mirror! 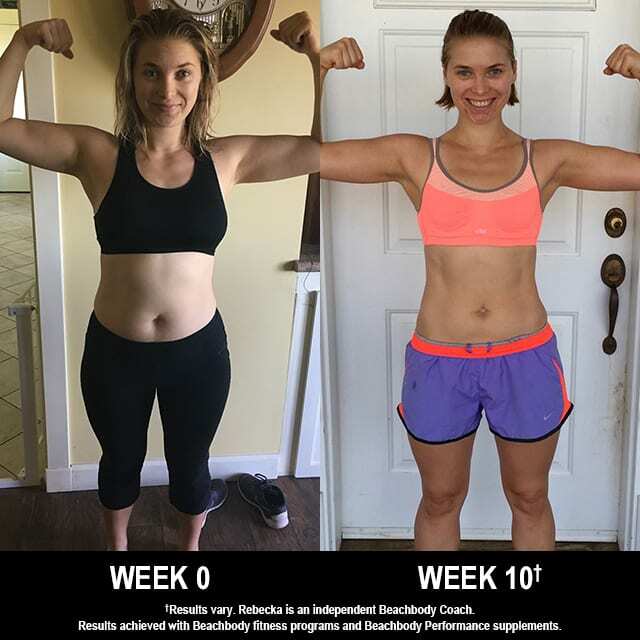 I wanted more energy for my two kids, and I wanted to feel confident. I wanted to be thriving instead of just getting through each day! My girls are my inspiration. I finally told myself that enough is enough. I will change my life for my kids. To show them anything is possible and to never give up. If you want something, go get it! My greatest challenge was finding support and accountability! The Beachbody family has pushed me and supported me through every part of this journey. I’m so excited to see what’s to come and to keep pushing myself! Big things are ahead for me! I liked the high intensity and faster pace. I liked that you didn’t need equipment throughout most of it. I lost 20 pounds. But what I’m most proud of is that this is the first time I started a program and finished it! I just started another round because I fell so in love. I’m proud of not giving up and pushing myself out of my comfort zone. I’m happier and healthier, and have more energy and confidence. I’m happy in my own skin. I’ve learned from this that when you love yourself, you are able to love others. My girls are noticing a difference and are asking to work out. They ask to eat vegetables! This hasn’t only changed my life, but also my loved ones. I plan to continue this healthy lifestyle and to help others achieve their goals as well! Oh my gosh, Shakeology is my new best friend! It has been a lifesaver when busy with the kids and as a post-workout meal. It has given me more energy, and I just feel healthier!2 The Recover is also amazing! I find that when I take Recover post-workout, I am much less sore for my next workout.2 This has allowed me to give my all on each workout!